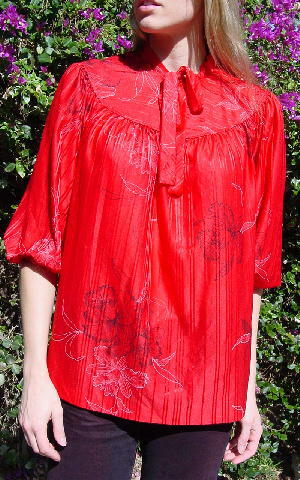 This bright lipstick red blouse has tone-on-tone vertical stripes as well as a pattern of orchids and leaves, some outlined in black and others in white. It has a peasant styling to it. It has 3/4 length sleeves with elastic at the bottoms, and a band collar which continues on to become two 21 3/4" long ties. 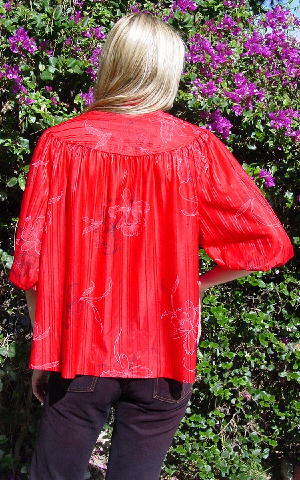 It has one button by the neckline, and a rounded yoke front and back with gathering extending downward front and back. A model wore it during her pregnancy. She said she always got lots of compliments. neck opening side to side 8 3/4"
side to side at bottom hem 27"